There was indeed a large-bank funding advantage during and for some time after the crisis, but it has now been diminished or gone away — maybe even slightly reversed. That is, financial markets are now acting as if they believe that future bailouts won’t be as favorable to fat cats as the bailouts of 2008. This news is part of broader evidence that Dodd-Frank has actually done considerable good, on fronts from consumer protection to bank capitalization …. The report [that Krugman relies on for his claim that too big to fail] doesn’t really say that future bailouts won’t be as favorable to the fat cats, or even that market participants believe that: it does say that large financial institutions would likely continue to enjoy lower funding costs than their counterparts in times of high credit risk (see page 40). Furthermore, the report so completely second-guesses itself that it shouldn’t be taken as evidence of anything, as the report itself states in numerous spots. Presumably a Nobel Prize winner has come across reports with muted conclusions before and would know not to get too far out in front of the facts by amplifying them. The report did not say that the advantage has “essentially disappeared.” GAO ran 42 models to try and assess the subsidy. In 2013, 18 of those models effectively tested positive for the subsidy, 8 tested negative, and 16 showed nothing. That’s fairly inconclusive, and not at all as definitive as Krugman makes it. 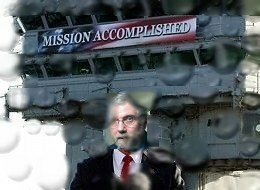 Gretchen Morgenson reported on the same study in the news, and managed to get it right, contrawhat Krugman thought he could get away with on the op-ed page. Not exactly. As the report noted, the value of the implied guarantee varies, skyrocketing with economic stress (such as in 2008) and settling back down in periods of calm. In other words, were we to return to panic mode, the value of the implied taxpayer backing would rocket. The threat of high-cost taxpayer bailouts remains very much with us. There’s more: Morgenson actually watched the hearing about the report, and found credible questioning of GAO’s methodology, in particular the narrow way in which they defined the subsidy as entirely about lower debt costs, instead of the lower cost of equity and benefits to stockholders. I’ve also heard that bond prices, with their focus on immediate-term risk, are simply an inaccurate indicator of short-term borrowing costs, particularly those in the securities lending markets. Regulators, especially Hoenig at the FDIC, worry that banks are generally larger, more complicated and more interconnected than they were before the meltdown. And the average notional value of derivatives for the three largest firms exceeded $60 trillion at the end of 2013, up 30 percent from the start of the crisis. The giant regulatory diversion known as Dodd-Frank has actually permitted the TBTF banks to get even bigger and more dangerous. Indeed, JPM and BAC were taken to their present unmanageable size by regulators—ostensibly fighting the last outbreak of TBTF—who imposed or acquiesced to the shotgun mergers of late 2008. So now these same regulators, who have spent four years stumbling around in the Dodd-Frank puzzle palace confecting thousands of pages of indecipherable regulations, slam their wards for not having sufficiently robust “living wills”. C’mon! This is just another Washington double-shuffle. The very idea that $2 trillion global banking behemoths like JPMorgan or Bank of America could be entrusted to write-up standby plans for their own orderly and antiseptic bankruptcy is not only just plain stupid; it also drips with political cynicism and cowardice. If they are too big to fail, they are too big to exist. Period.